Madison Goetzmann and Prestigious. Photo © Sportfot. Wellington, FL — February 18, 2018 — Victory on the grass derby field on Sunday, February 18, in the $25,000 Hermès Under 25 Grand Prix went to 17-year-old Madison Goetzmann (USA) riding Prestigious at the 2018 Winter Equestrian Festival (WEF) at Palm Beach International Equestrian Center. On the grass derby field on Sunday, 50 entries competed over a course designed by Ana Catalina Cruz-Harris (MEX), and ten of those were clear to advance to the jump-off. Lacey Gilbertson (USA) and Seabrook LLC’s Baloppi set the early winning pace in 41.97 seconds with no faults, which would hold up for second place. Next into the ring for the jump-off was Ailish Cunniffe (USA) on Baloucento 2, owned by Whipstick Farm Ltd. They finished in 42.16 seconds and placed third. Five trips later, the winning time was lowered to 41.53 seconds when Goetzmann and her own Prestigious finished the jump-off. Three additional rounds were unable to catch Goetzmann’s time and stay clear through the course. It was the second win in a row for Goetzmann, who also captured Saturday’s $10,000 Hermès U25 Welcome with Prestigious. A field of 74 competitors took to the International Arena on Sunday in the $5,000 Peggy Cone WCHR Adult Hunter Classic to wrap up the much-anticipated World Championship Rider Hunter week at the 2018 Winter Equestrian Festival. Due to its size, the class featured a California split and pinned two different sections of winners. Tracy Scheriff-Muser, aboard Shoreline, and Samantha Karp, aboard Zentina B, prevailed. Scheriff-Muser and her veteran mount, Shoreline, topped the field in section A with two top scores of 88 and a total of 176. Scheriff-Muser is no stranger to this particular classic and expressed her enthusiasm to finally walk out of the International Arena with the blue. Zentina B, guided by Samantha Karp, received the highest score in the division of a 90 in the first round and came back to get an 84 in the second with a total of 174 to secure the section B win. Stephanie Danhakl of Pacific Palisades, CA topped the $5,000 WCHR Amateur-Owner Hunter 3’3” Classic aboard her own Enough Said and also took second riding her own Quest. After earning the Adequan Amateur-Owner Hunter 18-35 3’3” division title earlier in the week, Danhakl collected scores of 90 and 84 in the classic to finish on a 174 total with Enough Said. She bested herself by four points after also piloting Quest to scores of 86 and 84 to sit on a total of 170 for second place. Brad Wolf and Libretto rounded out the top three by combining scores of 82 and 85 for an overall score of 167. Caroline Ratigan and Trust remained unfazed after a scheduling change that moved the junior hunter competitors out of the International Arena and into the E. R. Mische Grand Hunter ring. The pair took two high scores of 87 in both rounds of the World Championship Hunter Rider (WCHR) Junior Hunter Classic 16-17 and emerged victorious. With a total of 174, the duo was tough to beat. Ratigan and the 10-year-old gelding have been partnered together for three years, and the two continue to best competitors in the hunter ring. Today marked their third consecutive first-place win this week in addition to winning the division championship on Saturday in the International Arena. Sunday’s final class of the World Champion Hunter Rider week went to one of the last entries to return for their second round in the WCHR Junior Hunter 3’3” 15 & Under Classic, Stephanie Smith and Clintano, owned by Sand Dollar Farm, LLC. The pair had a first round score of 84 and came back to earn an 85. A combined score of 169 was enough for Smith to capture the blue. Smith, of Saddle River, NJ, and Clintano also won Friday’s section A over fences class in the International Arena with a pair of 83 scores, and the young rider expressed how she entered the competition with continued confidence, despite being moved out of the larger ring due to a scheduling change. The $25,000 CP National Grand Prix was held on the grass derby field, and it was 20-year-old Victoria Colvin of Loxahatchee, FL who sped to victory on Clochard, owned by Neil Jones Equestrian Inc.
Lucy Deslauriers and Class Action. Devon, PA – May 27, 2016 – Junior Weekend at Devon Horse Show continued Friday as eight winners from sections of the four equitation divisions were invited back to the Dixon Oval to contend for the 2016 R. W. “Ronnie” Mutch Equitation Championship. For the first time, the coveted award was presented to the winner of a stand-alone class, rather than on an overall high-point basis. Each of the eight riders qualified for the Championship class by placing first in one of the equitation divisions – the ASPCA Maclay, the Pessoa/USEF Hunter Seat Medal, the WIHS Jumper Phase or the Platinum Performance/USEF Show Jumping Talent Search. This year, it was Lucy Deslauriers who rose up to earn the title, besting the field of talented young riders to claim the honor. Deslauriers, who trains with Stacia Madden of Beacon Hill Show Stables, chose to ride Class Action. The 17-year-old superstar carried her to wins in the WIHS and Talent Search on Thursday. Madden was very proud of Deslauriers’ performance and praised the rising talent’s attention to detail in her rounds. With blue ribbons already under their belts, Daisy Farish, T. J. O’Mara, Madison Goetzmann, McKayla Langmeier, Maya Nayyar, Katherine Bundy and Ellie Ferrigno also tried their hand at the Alan Lohman-designed course. Farish delivered a well-executed round atop Cassio and impressed the judges to secure the reserve champion honors. Following in third place was Goetzmann, who earned her ticket by winning a section of the Pessoa/USEF Hunter Seat Medal on Thursday. Fourth place was awarded to Ellie Ferrigno, who won a section of the Maclay earlier on Friday morning. Langmeier ended up taking home fifth, while Bundy, Nayyar and O’Mara all experienced some unfortunate difficulties on course to finish sixth, seventh and eighth, respectively. Madden, who holds a seat on the USHJA equitation committee, explained the committee’s thought process surrounding the decision to update the format of the Ronnie Mutch Championship. The action will continue with the Junior Hunter divisions on Saturday. Highlight events during the Devon Horse Show and Country Fair will include the $25,000 USHJA International Hunter Derby and the $225,000 Sapphire Grand Prix of Devon CSI4*. 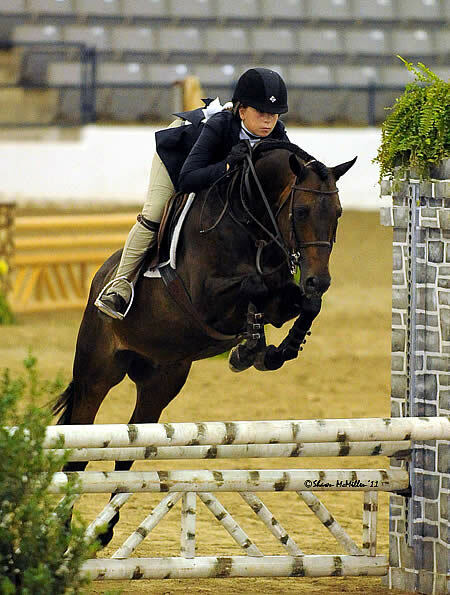 The Junior Jumper riders continued to showcase their skill Friday as the highlight event for the evening lineup at the Devon Horse Show and Country Fair. Longtime Devon competitor and former Pony Hunter Champion, Madison Goetzmann, and her veteran mount Wrigley bested a 10-horse jump-off to take home the Devon blue with a speedy clear effort at the end of the night. Francesca Dildabanian set the time to beat as the second to return for the tiebreaker with Catika Van De Helle. The pair produced the first double clear round, breaking the beam at 42.636 seconds. One round later, Eve Jobs rode with her eye on the prize aboard Sandor De La Pomme. They easily moved into the lead with a time of 37.932 seconds, but would only hold the top spot for a few moments. Goetzmann’s speedy mare Wrigley was in top form and easily sliced the sharp turns, clearing each obstacle. They galloped over the final oxer with the time in hand, crossing the finish line in 36.801 seconds. Jobs had one more chance to take the top spot with her second qualified mount Quickley 3, but in their effort to catch the time they lowered the height of the final oxer. They stopped the clock at 35.648 seconds, over a full second ahead of Goetzmann, but four faults would mean settling for fourth place. Goetzmann picked up the win, while Jobs and Sandor De La Pomme placed second. Dildabanian rounded out the top three aboard Catika Van De Helle. 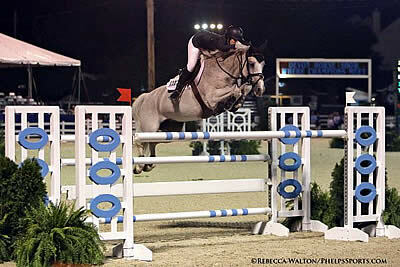 Goetzmann is now focused on winning Saturday’s main event, the $20,000 Show Jumping Hall of Fame Junior Jumper Classic. On Sunday, the Pony Jumper division will take over the Dixon Oval. Later this week, the best in the country will compete in Thursday’s $225,000 Sapphire Grand Prix of Devon CSI4*. Lexington, KY – The last day of the 2011 United States Equestrian Federation Pony Finals National Championships began bright and early with exciting competition in the Covered Arena at the Kentucky Horse Park. The EquiSport Insurance/USEF Pony Medal Finals brought the 2011 Pony Finals to an end. Leading the class from beginning to end with a solid two rounds over fences was Madison Goetzmann and Denmark to garner the championship prize. The top 20 riders returned for the second round including nine medium ponies, four small ponies, and seven large ponies. Today’s courses were designed by Bobby Murphy and consisted of short lines, rollbacks, a halt, and a trot jump. Goetzmann was at the top of the order for today’s second round and executed another flawless trip making the lines look easy. Goetzmann of Skaneateles, NY, and Denmark proved to be unbeatable, eventually earning them the Easter Sunday Memorial Trophy donated by Catherine A. Kaiser and Jennifer T. Pesko. Katherine Strauss of Southampton, NY, and Sumerland were originally ranked tenth during their first course; however, with an exceptional second round they earned the reserve championship honors. Lucy Deslauriers of New York, NY, and Macy Grey were ranked eighth coming into the second round and earned the third place honors after an impressive round.